The Sparrow sisters, Patience, Sorrel, and Nettie, are well known in their seaside New England town, Granite Point. They run the Sparrow Sisters Nursery, where flowers grow bigger and brighter than any you’ve ever seen before, and Patience’s remedies for everything from arthritis to allergies are highly sought after by many of the women in the town. But when Dr. Henry Carlyle arrives, everything changes. Like all outsiders, Dr. Carlyle is treated with suspicion by most of the townspeople. But Patience senses something in him that needs to be healed, and despite their differences, they find themselves drawn together. Soon the town is torn apart by tragedy—a tragedy in which Patience’s herbal remedies are implicated—and a modern-day witch-hunt threatens to overwhelm Granite Point. As the town withers around them, the women of Granite Point must band together to save the Sparrow sisters. But can they convince the rest of the town before it’s too late? The Sparrow Sisters is one of the books I was most excited to read from BEA. Something about the incredibly gorgeous cover just drew me in, and I’ve been quite enjoying my recent dabbling in magical realism (The Ocean at the End of the Lane, The Glittering World, etc. ), so although it didn’t sound like something I would normally go for, I thought I would give it a try. While I definitely enjoyed The Sparrow Sisters, I still have some undefined feelings about it. It kept me entertained and I liked the subtle fantasy elements, although I can’t help believing that I would have been a “bad guy” if I had been a character in the book due to the fact that I don’t believe in “alternative medicine.” No one wants to imagine they’d be a bad guy in the imaginary universe they’re currently enjoying, and I knew going in that The Sparrow Sisters was about a woman who peddles herbal remedies, but it still frustrated me a little. Other than that, though, The Sparrow Sisters was pretty good: I liked the writing style, the characters were well drawn and realistic, and the story was engaging. I particularly liked the little bit of romance between Patience and Dr. Carlyle, especially since it wasn’t the focus of the story. I think a lot of people think I’m this heartless curmudgeon because I don’t really like reading romance, but mostly I don’t like romance when 1) it’s superfluous to the story and just added as a draw (looking at you, Hobbit movies) or 2) when the story is all about the romance. That’s just not something I’m interested in. But when the romance is part of the story, done well, and not too overly dramatic (omg, I think he looked at another woman! No, just…no), I quite enjoy it. The only other thing I could nitpick is what I found to be a sort of anticlimactic ending, but considering the trajectory of the story and the nature of the setting, an anticlimax might really have been the most appropriate ending. I suppose the genre is “magical realism” for a reason, and not “magical unrealism.” Still, to me it seemed a little like, “I can’t figure out where to make this story go, so it’s going to be over.” Maybe not as egregious as some other books I’ve read, but it was still surprising/disappointing when it was over. 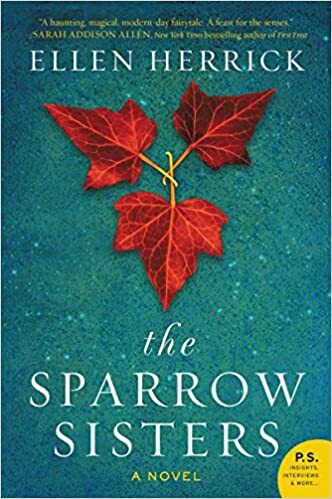 In the end, though, I did like The Sparrow Sisters, and I think you will too! It’s out tomorrow from William Morrow!